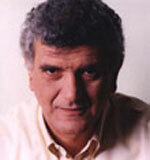 24 April 2005: George Giannopoulos, former Mayor of Rhodes, was born on 5 December 1954. He studied architecture in the Metsovo Technical University of Athens, and since 1978 he has been working as an architect and town planner. 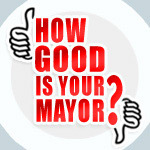 He is currently serving a second term as the city’s Mayor. He was first elected in October, 1994, and re-elected in October, 1998. His first contact with local governance and politics in general began in 1977. At that time he became a board member of the Association of Architects and Engineers of the Dodecanese District. Two years later he was made president of the association, remaining in that post until 1981. In Greece a year later the PASOK political party (Hellenic Socialistic Movement) was elected, and formed the government. An active member of that party, Mr Giannopoulos was ‘located’ as the Prefectural Councillor of the Karpathos and Kassos Province (1983-1985) until he ‘moved’ to Rhodes to become Prefectural Councillor of that province. He remained in that position until 1991. Between 1983 and 1994 he was elected first secretary of the board of the South Dodecanese Local Chapter of Pasok. Thus was his time occupied within local government in Greece, but being a politically active representative of the local authorities he decided, in 1994, to become active abroad. So in that year he became a member of CEMR'S Policy Committee, serving until 1998. In that year he was re-elected for a second term as president of the Union of Local Authorities of the Dodecanese District, board member of the National Union of Local Authorities of Greece and a member of the Executive Committee of the Union. In early 2000 he became a member of CEMR'S Executive Bureau, and a year later a founding member and chairman of the Board of the Council of Greek Island Municipalities. Last, but not least, Mr Giannopoulos was elected in 2001 to the position of vice president of CEMR. Five months ago he was elected to the board of that association, representing the Greek voice of local authorities in the United Europe. His duties as Mayor have not prevented him from showing a lively interest in what is required to promote a vital part of the local economy - tourism. He is president of the organisation promoting and advancing tourism in Rhodes. He is also president of the Board of the Public Water Disposal Company of the island and a board member of the Intermunicipal Company of Tourism and Construction of Rhodes. These positions have combined to afford him every opportunity to fight for the interests of the economically underdeveloped Greek islands  opportunities that he has used and continues to use.